The average (mean) compounded annual return was negative 1.06%. 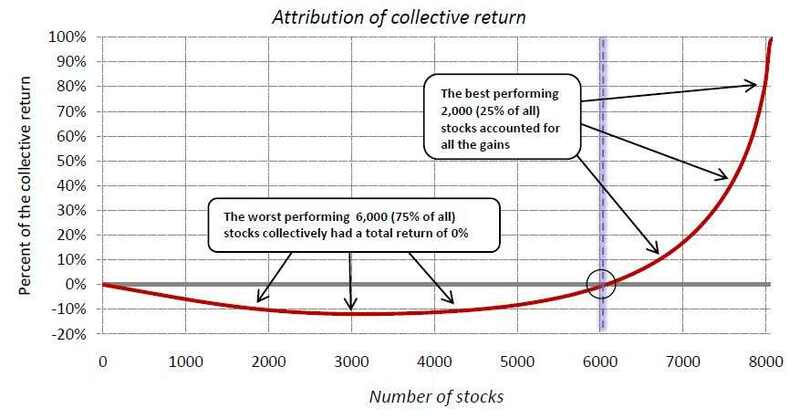 75% of the stocks in the data set collectively provided a 0% return, while the top 25% of stocks provided for all the gains. 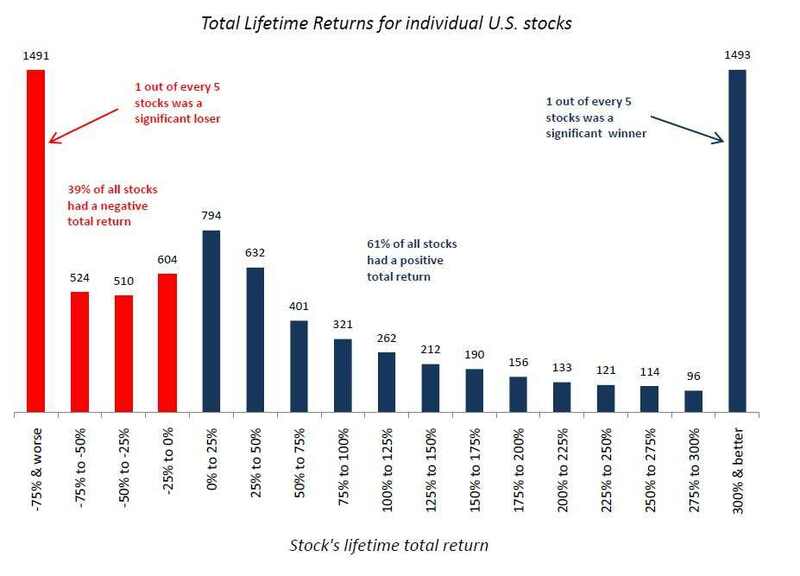 This emphasizes the importance of holding these crucial winners in your stock portfolio (as no one can know every winner or loser in advance due to competition and rapidly changing market dynamics, it emphasizes the importance of diversification). I'll note this data set starts and the bottom and concludes at the top of one of the greatest bull market runs in history (1983 to 2007). If the data set were to be extended into early 2009 the results would be far more negative. Nearly 92% of economists surveyed this week by the Wall Street Journal expect that our eight-year experiment with unprecedented monetary easing from the Federal Reserve will come to an end at the next Fed meeting in December. Since we have had the monetary wind at our back for so many years, at least a few have begun to question our ability to make economic and financial gains against actual headwinds. But in reality, the tightening cycle that the forecasters are waiting for actually started last year. Sadly, the markets and the economy are already showing an inability to handle it. While it’s true that we have yet to achieve “lift-off” from zero percent interest rates, rates have not been the only means by which the Fed has provided stimulus. We also have to account for the effects of Quantitative Easing (QE) and forward guidance of the Fed. Changes in those inputs over the past year have already created conditions of monetary tightening. 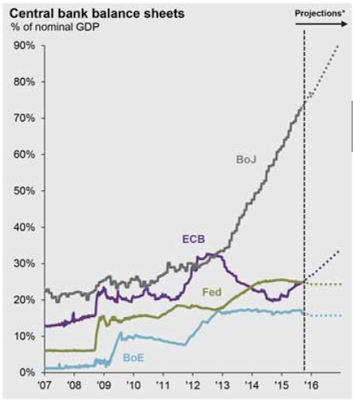 QE has been the process by which the central bank expands its balance sheet (otherwise known as printing money) to buy government and asset-backed bonds on the longer end of the duration spectrum. In so doing, it is able to help hold down long-term interest rates, a result that it would be difficult to achieve by changes in the federal funds rate. 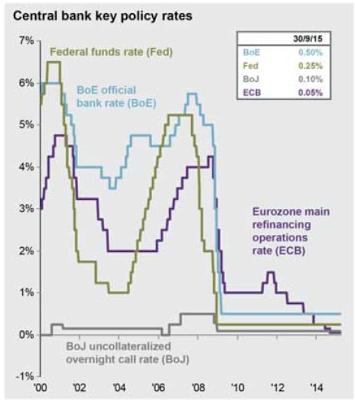 Zero percent interest rates represent a loose monetary policy, but once at the zero lower bound, QE is the way the bank eases even further. Another big input is Fed “forward guidance.” This comes in the form of official and unofficial pronouncements from top Fed policy makers as to the possible trajectory of rates in the future. If the Fed communicates that rates will stay low, or QE will remain in place, for some time, then policy becomes looser still. Such assurances effectively remove near term interest rate risk, which stimulates financial activity. Ever since the Financial Crisis of 2008, the Fed has engaged in unprecedented forward guidance, without which monetary conditions could have been expected to be tighter. But the Fed’s QE tapering campaign, which gradually reduced the amount of securities purchased monthly by the Fed, effectively began a campaign of monetary tightening that helped push up the Shadow Rate sharply even as the fed funds rate itself did not budge. After QE was officially wound down in October 2014, the Fed began to change its forward guidance to actively suggest that a long-term campaign to lift interest rates would begin in 2015. This also worked to help tighten monetary conditions. As a result, the Shadow Rate moved up from -2.99% in May of 2014 to just -.74% in September of 2015, (FRB Atlanta, CQER, Shadow Rate) an increase of 225 basis points in just over a year. This is a fairly robust tightening trajectory that can be said to have clearly taken a toll. Since January of this year, the major market index, the S&P 500, has essentially been flat. While in contrast, it had been up by double-digits in five of the last six calendar years. Similarly, GDP growth has slowed considerably in the months since the QE program was finally tapered down to zero in October of 2014. U.S. stock investors may be complacent regarding the ability of the stock market to withstand higher interest rates. Their confidence may come from the fact that, historically, markets have not peaked until 12-24 months after the Fed begins to tighten. This assumes the tightening cycle begins with the first official rate hike. But if it really began with the increase in the Shadow Rate, then a December rate hike will already be 19 months into the tightening cycle! Plus, given how overvalued stocks may currently be, and the amount of corporate debt accumulated to finance share buybacks, this bull market may be far more vulnerable than most to higher interest rates. The last three times that the Fed had conducted a rate tightening cycle (1986-1989, 1994-2000 and 2004-2006), the increases in rates averaged 388 basis points. But those moves upward occurred when QE did not exist and when forward guidance was hardly a factor (the Fed only started doing press conferences in the last few years). So the tightening that has occurred to the Shadow Rate in the last year is already 58% of the size of the average of the last three tightening cycles. If the Fed does as it has suggested it will, and takes fed funds up to 2.6% by the end of 2017 (which is the Fed’s own median forecast), then the total effective move (that includes the tightening of the Shadow Rate) would be a tightening of 559 basis points, well larger than the average of the last three tightening cycles. Does anyone really believe that our fragile and slowing economy can deal with that kind of headwind? Since the Second World War, recessions have begun, on average, every seven years. Since the current recovery is already seven years old, how much longer should we expect this historically anemic recovery to last? If the slowdown occurs next year, can we really expect the Fed to remain on the sidelines and risk the possibility that the economy goes into a recession leading into a presidential election? Both the chairperson and vice chairman of the Fed are solidly associated with the left side of the political spectrum. Should we expect that they would be hesitant to support the markets and the economy and thereby create conditions that might help Republicans take the White House? Nevertheless, most people assume that rates are on the way up to 2% or more. But from my perspective it’s much more likely that the rates never get close to that level. I would argue that any positive rate of interest would be enough to stop this economy cold. Years of negative rates have so corrupted our economy that I believe it is now fully addicted and cannot survive under any other condition. Since this historically weak recovery is already decelerating, one might expect the removal of stimulus could cause the next recession to start quicker and be far deeper than any experienced in the past. Since the Fed may recognize this, the next easing cycle could likely start much sooner, and the accompanying monetary stimulus be much larger than just about anyone believes. Each of the last three easing cycles took rates lower than where they were at the end of the prior easing cycle. Given that the fed funds rate is at zero (and the Shadow Rate got to as low as -2.99%), one shudders to think how low the Fed is prepared to go the next time around. As a result, investors may want to consider re-positioning their assets for another period of possible monetary easing not a period of tightening, which I believe, in fact, is already well underway and will soon be a thing of the past. December is far less significant than what almost everyone has been led to believe. "Portugal has entered dangerous political waters. For the first time since the creation of Europe’s monetary union, a member state has taken the explicit step of forbidding eurosceptic parties from taking office on the grounds of national interest. Democracy must take second place to the higher imperative of euro rules and membership." This is only a warm up. During the next financial crisis you will see unprecedented action taken by current government officials around the world to try and keep control of their power. One of the most thought provoking pieces I've read this year is Artemis Capital's October Newsletter titled "Volatility & The Allegory Of The Prisoner's Dilemma" (see below for the full newsletter). There are numerous subjects within the letter that are well worth expanding on, but I'd like to focus on one in particular here today. Alan Greenspan took over as chairman of the Federal Reserve on August 11, 1987. Just two months after he was sworn in the U.S. stock market experienced the largest one day drop in history; a 22% decline. Greenspan immediately took action to calm the markets through interest rate cuts and liquidity. That momentous fall began the period the period now known as the "Central Bank Put." If the markets were to ever get into trouble, central banks would immediately react to the stem the crisis and "help" the markets resume their climb higher. We saw this in 1987, 1994, 1998, 2001 - 2004 and 2007 - 2012. Each "put" became larger in scale and duration to help quell any concerns and push investors back into the pool of risk assets. The markets became accustomed to the put, but they were still aware a crisis needed to occur first, before central banks would take action. This all changed in the summer of 2012 when Mario Draghi unleashed his "whatever it takes" speech. The European Central Bank stood ready to print money to purchase an unlimited amount of government bonds to ensure yields remained at manageable levels. Why was that speech key? Because it marked the end of the central bank put era and ushered in a new even more incredible chapter in central bank history. In today's financial world central banks do not wait for a crisis or market decline to occur before they take action; they now follow a policy of "pre-emptive" central banking. "To differentiate, pre-emptive central banking refers to monetary policy action in anticipation of future financial stress to avert a market crash before it starts, even if markets appear healthy and volatility is low." Just weeks after Draghi's speech in 2012 the Federal Reserve launched QE3. At that time there was little to no stress in the financial system, the economy was gaining jobs monthly, interest rates were resting at all time historical lows and the stock market had already doubled off the 2009 bottom. 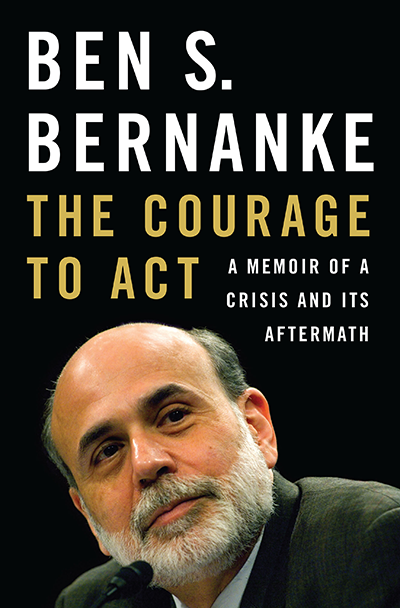 In essence, Bernanke felt something could be coming so he decided to act before it even arrived. The following year in 2013 the Bank of Japan provided an encore with their own gargantuan QE program, which they then enlarged in 2014 (it's still running every month!). When the Bank of Japan launched their program to purchase government bonds, interest rates were already resting close to 0%. The European Central Bank joined the party over the last year with a QE program which still runs today while interest rates across Europe are negative on government bonds years into the future. Earlier this week they announced plans to enlarge the size of the current QE program and bring interest rates on deposits further into negative territory. Why? They have tasted the QE drug and love the way it feels. They want to pour more liquor into the punch bowl to make sure investors have no desire to leave the party. More widely watched here in the United States was the Fed's decision to keep interest rates at 0% because the stock market had fallen about 5% off its all time record bubble highs in August. The central bank put taught investors that if they were ever caught in a downdraft they would be quickly brought whole and could expect new highs in short order. 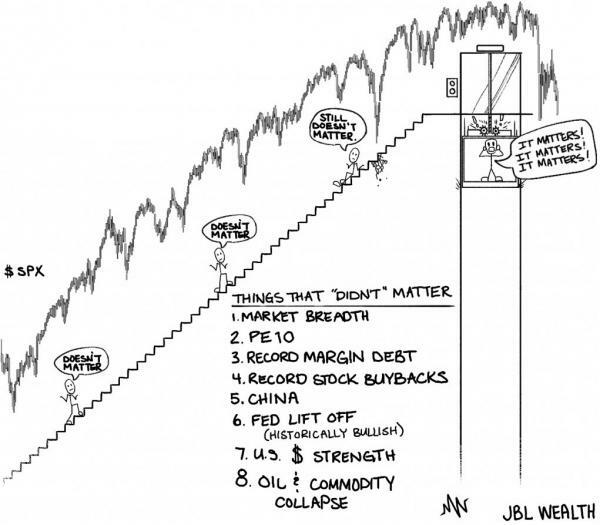 Any dip was to be immediately bought in every market; stocks, bonds and real estate. The put policy was enough to create the environment entering 2008 that almost destroyed the entire financial system. What we have today with the pre-emptive policy is far, far more troubling. Central banks are leveraging up their easing programs before the markets even have a chance to correct. Any fear by investors in risk assets that markets could even decline in the short term has now been erased. This, of course, is seeping into every asset class; stocks, bonds, residential real estate, commercial real estate, art, venture capital, private capital.....EVERYTHING. The psychology behind this self-reinforcing paradigm is both fascinating and disturbing. It is the market's collective belief that central banks have the power to elevate and permanently push markets higher that is actually pushing markets higher. The danger exists because the narrative behind this paradigm is actually false. Central banks have no actual ability to push markets higher (as seen during their continuous easing during 2007 to 2009 while markets were collapsing). It is only a false belief in a power that does not actually exist that keeps a bid under risk assets. At some point asset values reach an absurdity that is so far removed from reality that some market participants began to look around and become concerned. This moment can be delayed for far longer than rational participants can imagine, but it always arrives. It occurred for technology stocks in March of 2000 when a few investors looked at their portfolio of 300x P/E tech stocks and decided to take some profits. It will occur at some point as well for those investors holding negative yielding bonds for insolvent countries like Spain and Italy. The stories we will tell in the future looking back at the absurdity of the world we live in today will make people buying Pets.com in 2000 and purchasing 17 homes to flip in the Las Vegas desert in 2006 seem tame in comparison. Unfortunately, the underlying losses are now baked into the cake. The U.S. stock market is now many deviations away from historical fair value based on real life fundamentals of the companies they represent. If interest rates for U.S. bonds were to rise only 300 basis points back up to around the 5% level (still well below historical levels) it would create losses across the board of at least 20% on portfolios (rising bond yields mean the principal value of the underlying bonds decline). Those are only the losses you can instantly quantify. 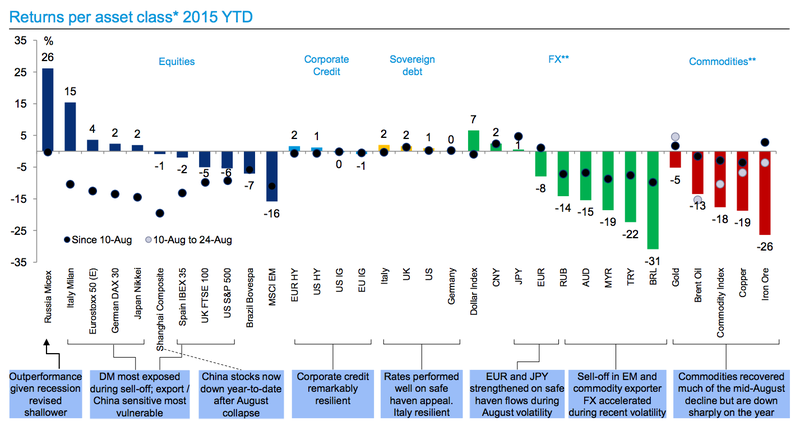 The secondary impact would be felt in asset classes around the world. Mortgage rates rising would essentially shut down both residential and commercial real estate activity. 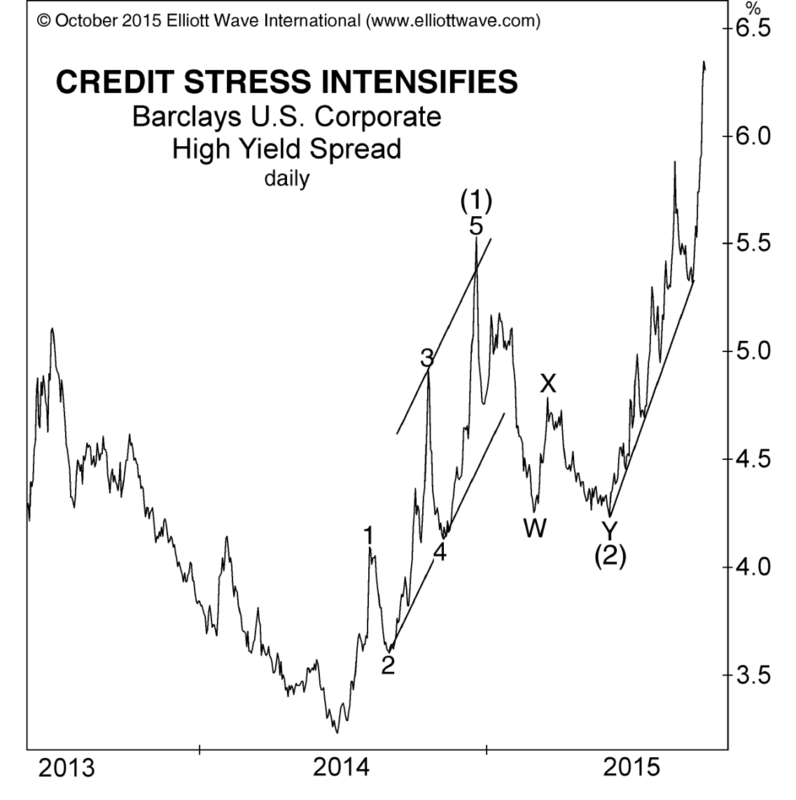 The junk bond market, perhaps the largest risk in today's bubble universe, would implode. The derivatives market, or the the insurance put in place to cover losses in the bond market, would reveal itself again the way it did in the fall of 2008. Who is the AIG out there that provided the insurance for the $5 trillion in fracking junk bonds (remember the entire subprime real estate market was only $1 trillion in size)? My guess is they are not going to have the cash to cover the losses. How much longer can this go on? I have no idea. All I know is the further we go down this rabbit hole into the realm of the absurd, the greater the losses will be when the risk off mentality returns. Back in September of 2012 when the world had either forgotten or hated the Chinese stock market (which was trading at 2060), I wrote an article titled China's Stock Market Continues To Plunge: Buying Opportunity? 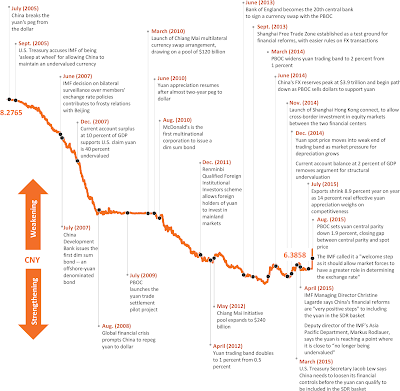 I outlined the reasons why I had begun to purchase Chinese shares which centered around sentiment, valuation and my long term bullish outlook for their economy over the next century. About two years later to everyone's surprise (including mine) Chinese shares began to accelerate upward rapidly and then went vertical. At the end of March with the market trading at 3822, I wrote an article titled China's Stock Market Continues To Soar: Selling Opportunity? I outlined the reasons why I was selling my shares which centered around sentiment, margin and valuation. 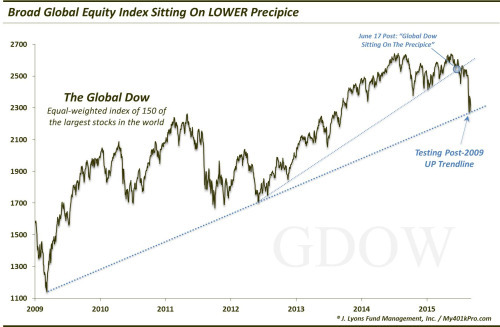 The market had essentially become the opposite of what it was in late 2012. Ironically, the Chinese economy was far stronger in late 2012 than it was entering the fall of 2014. This was another great lesson for me that markets in today's world (post 2011) seem to have less and less correlation with economic fundamentals. As a quick side note, I am not trying to brag about my market "timing" with Chinese shares. In general, I am a pretty terrible market timer. I like to buy assets when they are cheap and hated and sell assets when they are overvalued and loved. That usually means I am very early to markets (I had to wait 2 years before the Chinese market did anything), and usually sit out for prolonged periods of excess and irrational exuberance (as the U.S. stock market has been in for about 3 years). The only reason I took action on the sell side was because the Chinese market had put in gains that would normally take about 10 years to occur over an 8 month period. The euphoria (which equals danger to me) had reached a perilous state. 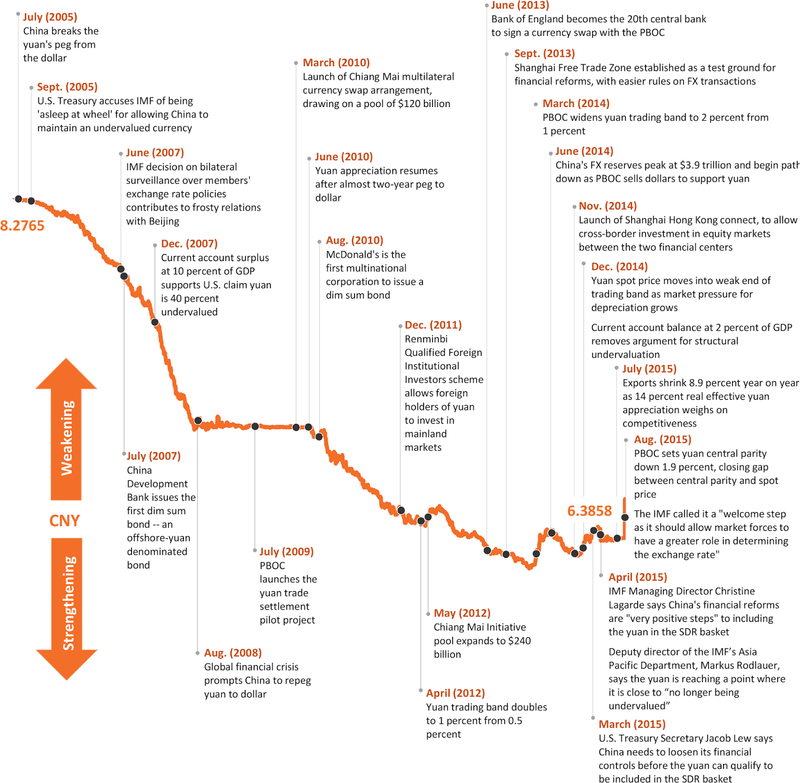 Almost everyone knows the China stock market story following March 31, 2015. The market continued to move higher for a few more weeks, crossing over 5000, before it quickly collapsed back down to the 3000 range over the next two months. The question I am often asked today is whether or not I would enter the market at current prices. In terms of valuation and sentiment I am essentially neutral on the market. It has rallied up to 3,424 as I write, bringing some brave souls back into the water. The biggest change for me personally is what I watched occur during the market decline. Chinese officials essentially panicked, pulling out every measure you could imagine to stem the market's decline. 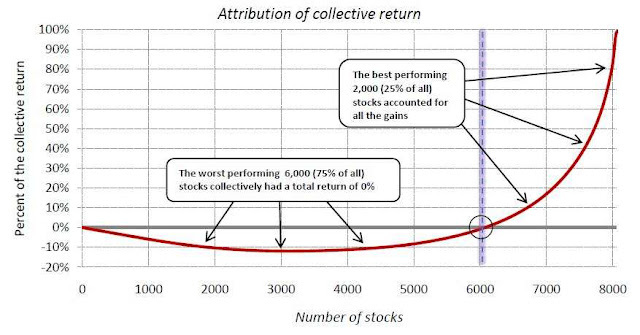 They even went as far as to stop trading many of the stocks on the exchange. One of the benefits to investing stocks in general is liquidity. Unlike a real estate asset which can take months to sell, stocks can be liquidated in seconds with a keystroke. 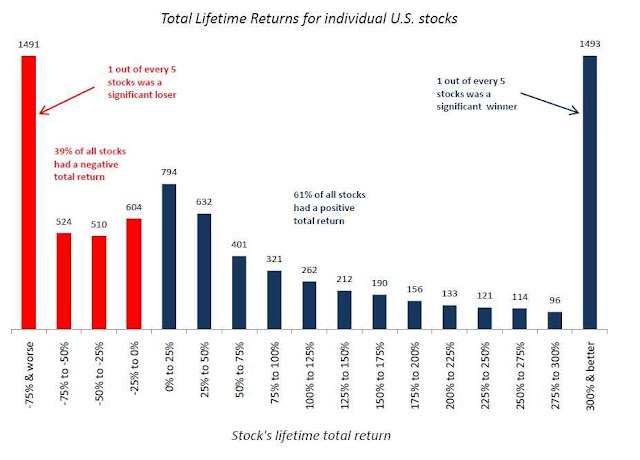 It is part of the reason why investors (including myself) pay a premium to own stocks over other assets. If Chinese regulators are going to turn off the ability to sell a stock at the first sign of a market decline, it essentially removes this liquidity premium. I have not heard them mention once they will allow the markets to trade freely in the future, which is probably because they are still terrified of further declines. Until I hear and believe they have made changes to this policy I will continue to be a spectator in their share market. If valuations and sentiment once again become too tempting to pass up (even with the liquidity premium removed) I will let you know I have once again begun making purchases. "We’re in a funny kind of circular logic world, where, since the Fed acknowledged a strong dollar could become a variable, that meant the odds of the Fed increasing interest rates declined. One of the reasons the dollar stopped strengthening is the consequence of the Fed mentioning its strength has been problematic, meaning there's less likelihood of them tightening. But the reason the dollar was getting so strong was that the Fed was talking about tightening. You see the circular logic: The dollar is strong, so they can't tighten. So the dollar weakens, so they can't tighten. So the dollar strengthens, so they can't tighten, so the dollar weakens, so they can't tighten. And around we go. That’s where we are right now." The CAPE price to earnings ratio on the S&P 500 currently rests at 25.5. That level is close to where stocks peaked in 2007 and a long way from the mania peak in 2000. Can the markets launch into a final round of irrational exuberance a la 1999 and push to those previous mania highs? Of course. Do I want to risk my capital hoping that happens? Nope. I'd rather play Keno at the gas station because the odds are better. 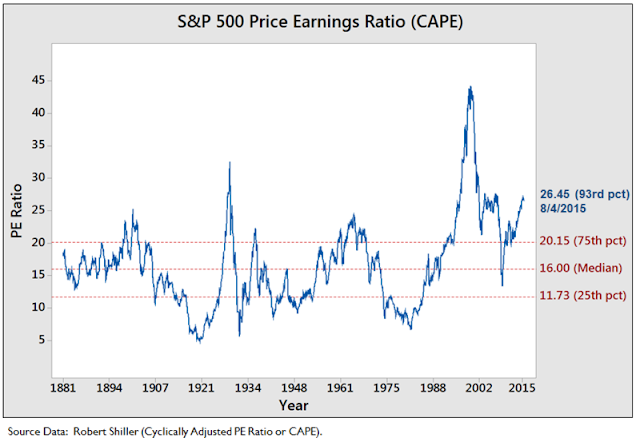 The average CAPE price to earnings ratio going back to the late 1800's is 16. Previous secular bear markets have bottomed when the CAPE reached single digits. I believe we are currently in a bull market rally (2009 to present) within a secular bear market that began in 2000. I also believe we're likely to see a single digit CAPE before the current bear market ends, but I'll be a buyer of many U.S. stocks before the broad market gets there. What does that mean in the short term (next few years)? U.S. stocks are going a lot lower. There was a tremendous amount of attention paid to the sharp move higher in the VIX (fear/volatility) index during the sell-off a few weeks ago. However, when you take a step back you can see that move looks like a blip on the radar compared to recent market panics. I believe the VIX will experience additional (even larger) surges as we move forward. The average length of an American economic recovery is 40 months. We are currently in month 74 of the current recovery, which makes it longer than all but 4 in history. 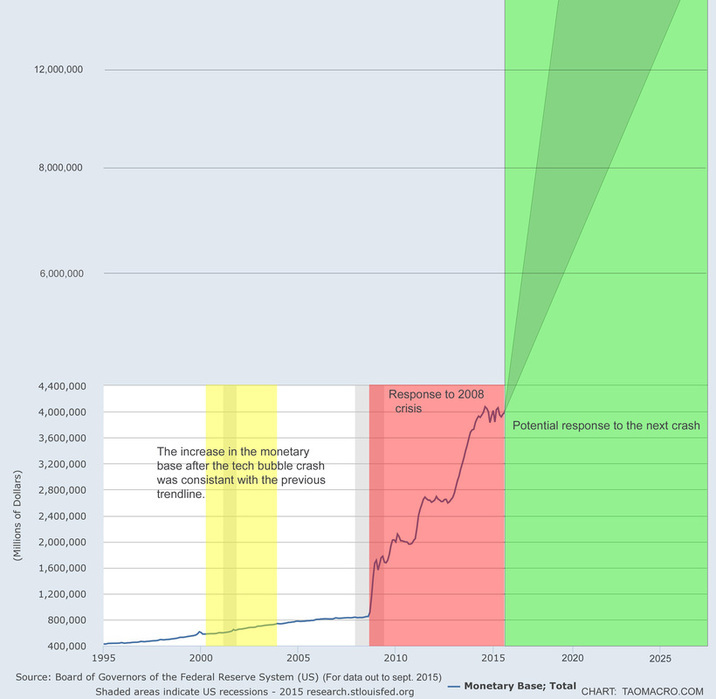 Why have recoveries tended to last longer in the most recent decades? The Federal Reserve and U.S. government have intervened in the markets to juice them up whenever they begin to show weakness. This creates an environment where fear leaves the economy, speculation flourishes, and investors leverage up knowing the Fed and government "have their back." The result is always the same; a massive collapse. Recessions, bankruptcies and price declines strengthen the economy and allow it to begin growing again on a stronger foundation. Like a drug addict entering rehab or a forest fire helping germinate and create new growth, removing that natural healing process creates the boom bust cycle we have been experiencing on a larger and larger scale. U.S. bonds are sitting close to multi-century lows. They look about as dangerous as U.S. stocks if not more. I do not believe interest rates will move back to the 15%+ range we saw in the late 1970's (although its possible), but I do think rates will move, at the least, back to their historical range between 5% and 7%. From a starting point of 2.2% today on the 10 year treasury this would decimate real estate prices, raise corporate borrowing costs (crush profits) and raise annual interest costs the U.S. government owes on its $18 trillion and growing debt pile. I continue to accumulate U.S. cash and dollar cost average into precious metals (silver and gold mining shares), agriculture, and emerging markets (see below on Brazil). While I believe all these markets have short term downside potential (hence the cash accumulation), they represent significant long term value combined with massive pessimism. I do not know the day these assets will bottom, but I believe they will all perform better than the stocks, bonds and real estate of most developed markets (US, Japan, UK, etc.) over a 5 year period from current levels. An incredible visual walk-through showing the GDP size of American states in relation to entire countries around the world. Sometimes you can forget how big the U.S. economy is. It should also provide a pause for concern considering the GDP of Illinois is about 3 times the size of Greece and Illinois is bankrupt. About 10 months later the currency is about exactly where it was when I wrote the article (against the U.S. dollar). If you invested in a 3 year bond like I discussed in the article you are on track to make your 18% this year, and if you bought stocks you purchased into the best performing asset class on the planet in 2015. I think Brazil represents a similar buying opportunity today. Hopefully I don't have to paint the background picture for you on how terrible things are currently in Brazil. Every media outlet, television station, financial article and radio show are currently discussing why Brazil is about to enter a 200 year depression and the currency, stock market, real estate and Brazilian bonds are about to fall 90% from here. Yes, they have a political crisis. Yes, their government income is falling as their obligations are rising. That's what happens when your economy goes into recession. Yes, inflation is running high. Yes, government bond yields are rising, stocks are crashing and the currency is in free fall. Yes, they (corporations and real estate developers) borrowed a ton of debt in U.S. dollars and a lot of that debt will default. Let's collect ourselves for a moment and take a deep breath, take a step back, just as we did with Russia. Let's look at the much bigger picture. After the sovereign debt crisis in the late 1990's, emerging markets around the world began accumulating massive foreign exchange reserves (almost exclusively in dollars). As U.S. dollars poured into their countries due to their trade surpluses they recycled the dollars back into United States assets (treasuries, mortgage bonds, or cash). Why did they do this? If there was another currency crisis like we experienced in the late 1990's they wanted to have ammunition ready to fight it. If their currency began to fall rapidly against the U.S. dollar they would have the ability to sell dollars in the open market and buy their local currency. Foreign exchange markets work just like stock markets. If a massive buyer enters the markets to make large purchases it will stop the price from falling or cause it reverse course and rise. How large is Brazil's war chest? 368 billion dollars. This is the seventh largest reserve accumulation in the world. For the complete list click here. Brazil's total debt to GDP, which includes corporations, citizens and their government, is only 128%. That makes them one of the most responsible borrowers on the planet relative to the size of their economy. The debt to GDP ratio for Brazil has risen since the chart was put together below (but so has every other country above them). Stripping away their corporate and individual debt you can see their government debt to GDP is only 59% in 2015. 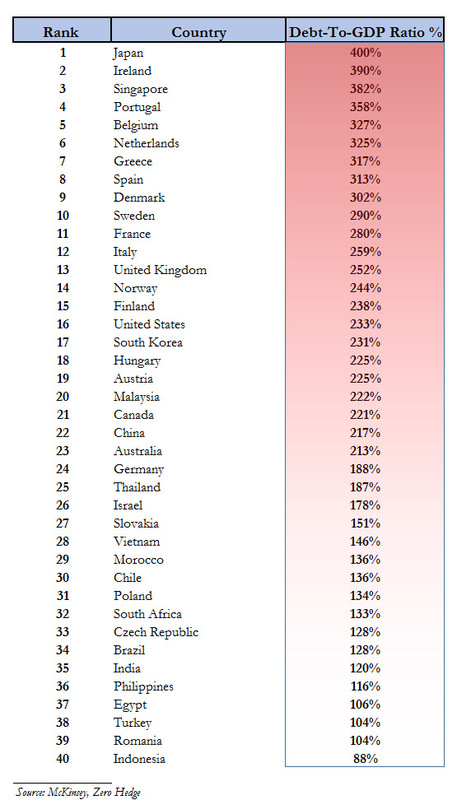 To help put this in perspective, Greece did not enter crisis until they reached 130% debt to GDP, the U.S. is over 100%, and Japan sits at over 250% debt to GDP today! Unlike Russia, I do not think the Brazilian stock market (in general) has fallen enough to make it a safe entry point (it's getting close), but I believe the currency and the bond market have. A three year government bond in Brazil currently pays a little over 15% annually. What are the risks? The currency can continue to plunge (probably likely in the short term) and/or the government can default on their debt (I believe the latter is highly unlikely). If the currency continues to decline you are getting paid to wait. Is it likely the Brazilian real will be lower against the U.S. dollar tomorrow and perhaps even 6 months from now, but I believe it will be higher than the U.S. dollar in 3 years. If you came down from Mars, landed on earth, and only had the data from two countries (the U.S. and Brazil), but you didn't know the names of the two countries, 100% of the martians would invest in Brazil. As I mentioned when discussing Russia, the idea of investing in Brazil is considered insane by almost everyone on earth as I type this today. That is part of the main draw for me personally as an investor. I like to buy things when everyone hates them and they have strong long term fundamentals. Brazil will rebound eventually. Perhaps I am early, or very early, as a buyer (I almost always am), but the intoxicating fear around Brazil tough is enough for me to begin making purchases. 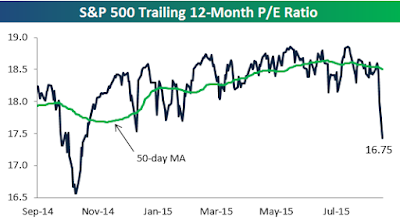 The trailing 12 month Price to Earnings ratio on the S&P 500 has fallen from 18.5 to 16.75 over the last week. This means stocks have become less expensive relative to their earnings (lower priced stocks are more attractive to purchase for value investors). Stocks are historically considered cheap when their trailing P/E ratio moves under 10 so we would need the S&P 500 to fall about 40% from here for stocks to provide a safe long term entry point. In addition, earnings would need to remain at the level they are today (price is only half the equation). If earnings fell (they are sitting at all time record highs), then stocks would need to fall significantly more than 40% in order to provide a safe, attractive entry point. Just a quick big picture overview for those hunting for bargains in the United States after the recent decline. Save your time; they don't exist (yet). Money tends to follow and pile into the trade that is working now, at least in the short term. One of the best trades this year has been to purchase stocks in regions of the world still employing quantitative easing (Japan and Europe) with your currency position hedged. In other words, capture rising stock markets while protecting your exposure to their local currency declining in value against the U.S. dollar. Investors have rushed into ETFs that employ this strategy. 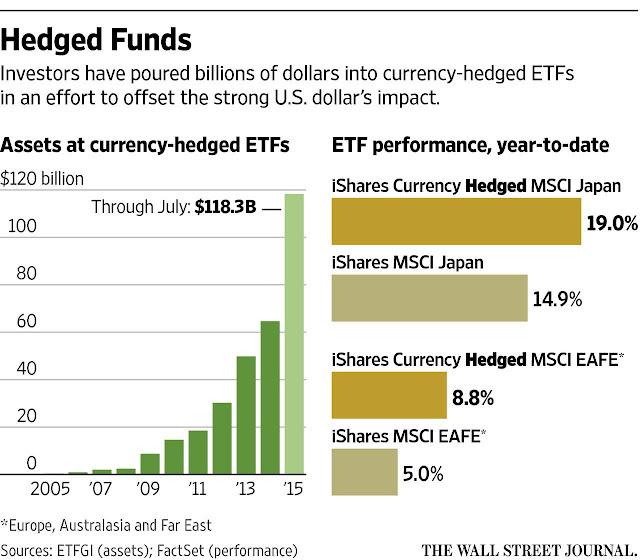 The following shows the rise of "currency hedged" ETFs, which reached $118 billion in size by July of this year. This is another great example of the extremely positive sentiment toward the U.S. dollar currently in place. I personally do not like to buy into a trend that is already locked in place. I like to begin buying what I believe comes next (which usually means losses and the need for patience in the short term). I am looking toward emerging market bonds and currencies today; the part of the world everyone is running full speed away from. Market participants believe the Federal Reserve will increase interest rates at one of their remaining 2015 meetings, and many assume it will come in September. They also believe and are betting with their portfolios the rate increase will result in a continued move higher in the U.S. dollar index after the spectacular rally we saw from 80 up to 100 over the past year (see red line in chart below). 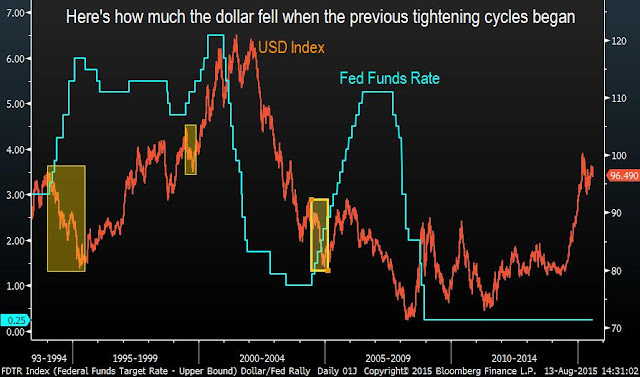 History shows the Federal Funds Rate does not correlate with U.S. dollar strength or weakness. Not only that, the last three times the Fed began increasing rates after an easing period the U.S. dollar index fell (see shaded areas below). The most notable period occurred in early 1990's when the Fed steadily increased rates from 3% to 6% and the U.S. dollar fell the entire time. 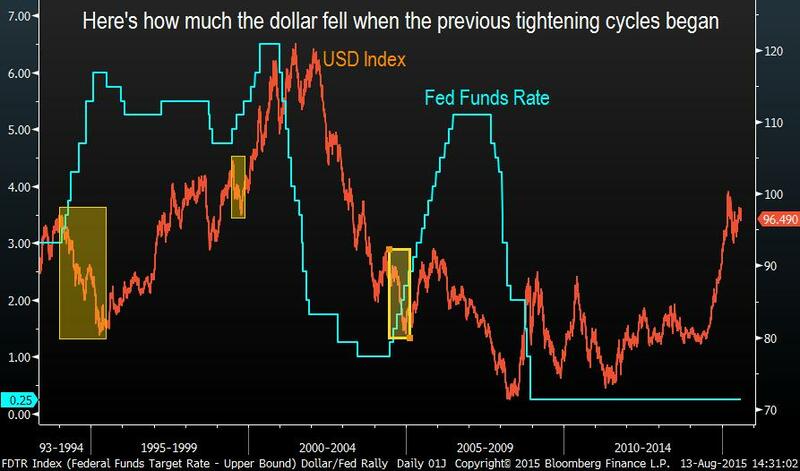 Does this mean this U.S. dollar will fall if the Fed raises rates this fall? No, it just means the act of tightening has no historical correlation on which way the index will move. The U.S. dollar index may very well continue its bullish march higher, similar to what occurred in the late 1990's after the initial brief decline (highlighted above). I believe a rate increase by the Fed has been "priced in" with the massive move higher in the dollar over the last year. 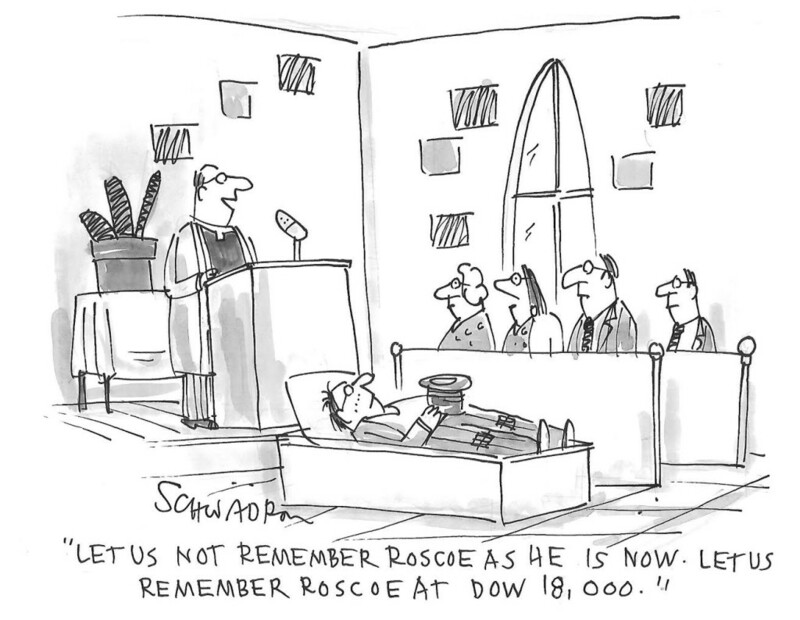 How the market will respond will be determined by what the Fed says comes next. There is a widespread bullish conviction the dollar will continue to move (much) higher from here. I like to take bets against those types of trades when I believe the underlying asset has long term fundamental flaws (the flaw being the United States is bankrupt backed by treasury I.O.U. 's which are backed by an electronic printing press). 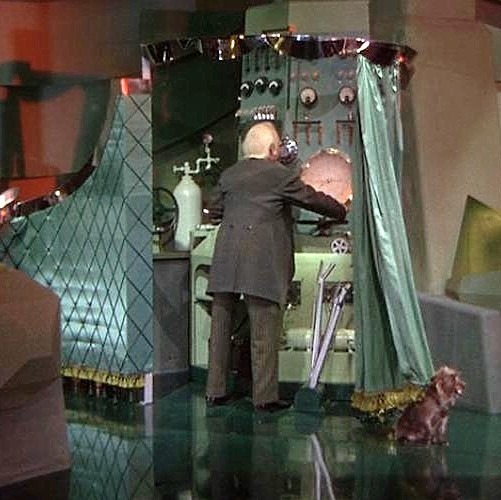 There is also the outside possibility the Fed will not raise rates this fall. Should that occur, with every living person on the planet positioned and betting heavily on a rate hike (long the dollar), I believe you will see a significant decline in the dollar over the next 6 months as there will be a rush to unwind those bets. I have already begun to move a portion of my U.S. dollar cash holdings into currencies that have been decimated, and I will continue to move more if the U.S. dollar strength continues. 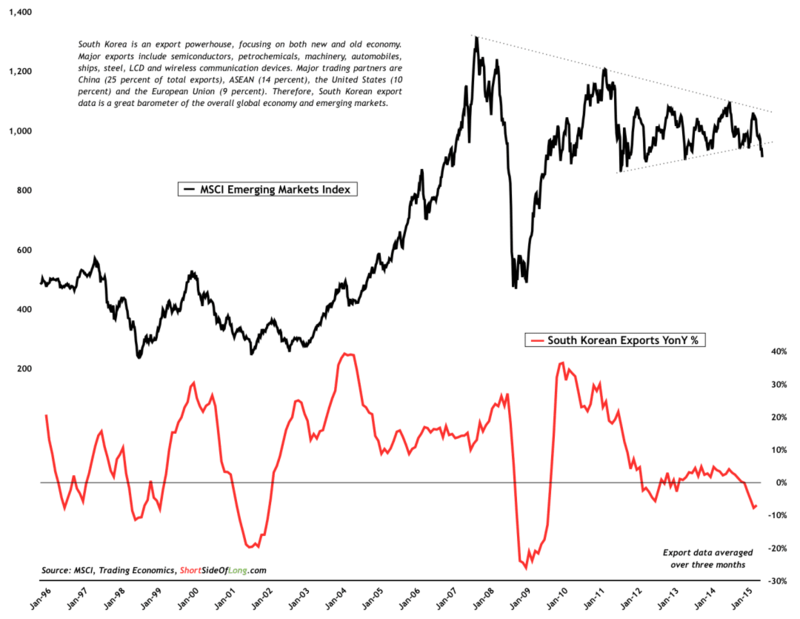 See: Emerging Markets Destroyed & Hated: Buying Opportunity? "There's no doubt that the 'p,' in this case the price of assets, I suppose, is sort of a question mark, and ultimately when central banks stop manipulating markets, where that 'p' goes, I think, is up for grabs and probably the arrow points downward." Emerging Market Currencies Destroyed & Hated: Buying Opportunity? Over the past few years when discussing my personal investment portfolio I have continuously noted I was raising and/or holding cash in U.S. dollars. I do not believe the dollar is a long term fundamentally strong currency, but I felt market forces would push it cyclically higher in the short term. 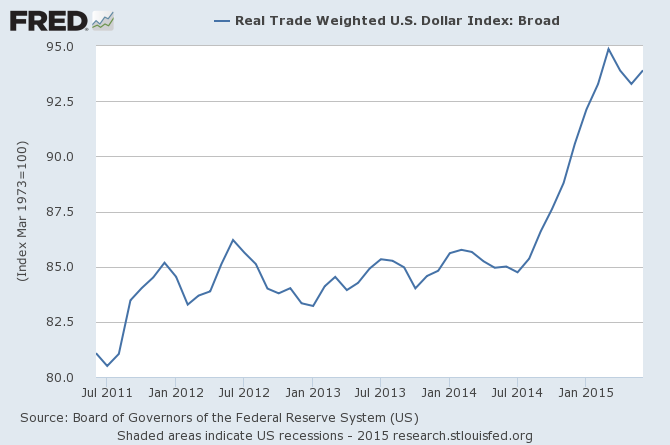 Since mid 2011 the trade weighted US dollar index has risen sharply. The dollar has staged a massive rally against essentially every alternative form of money or currency in the world, including precious metals. The dollar is now widely considered the bastion of safety, and the euphoria surrounding dollar bullishness has only grown stronger with the U.S. stock market surging simultaneously. There are certainly still factors in place that can push the dollar higher in the short term, but I am now beginning to diversify some of my cash holdings into foreign currencies. Why? These currencies have stronger long term fundamentals, their prices have recently fallen significantly and sentiment surrounding their future price direction is incredibly bearish. Everyone that "knew" the U.S. dollar would decline a few years ago is now just as sure it will continue to push higher from here. 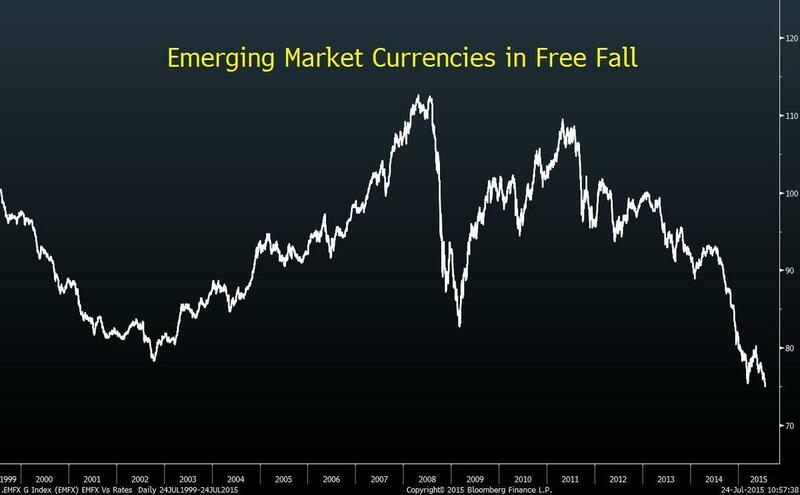 The following is a chart of emerging market currencies against the U.S. dollar. After steady declines since mid 2011 they have entered free fall. I am beginning to make purchases in the Brazilian real, South African rand, Russian ruble, Indian rupee, Canadian dollar, and Australian dollar. There are others, such as the New Zealand dollar, I am watching closely but they have not yet fallen enough to warrant a purchase. I like to get exposure to these currencies through the purchase of short term government bonds because they have high interest rates that pay you to wait and help ride through the storm. Stocks in emerging markets have essentially moved sideways or declined since early 2009 (black line below). 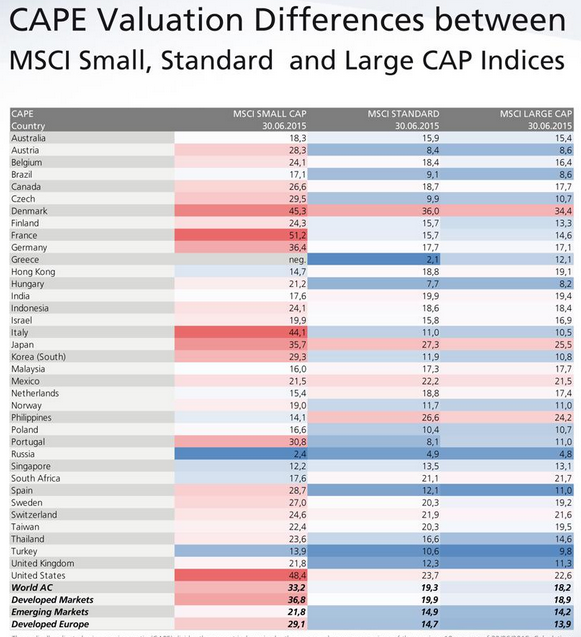 While most emerging market stocks have not fallen enough for me to enter the market, there are already pockets of value in certain stocks and countries. 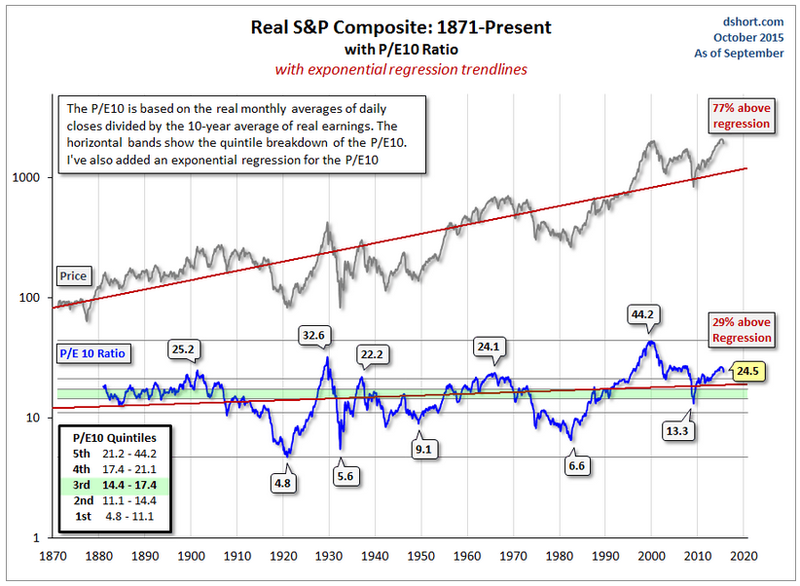 The chart below from Meb Faber provides a snapshot on how expensive or inexpensive some of the world markets are today based on the Shiller price to earnings ratio. You can see that while Brazil and Russia have moved below 10, the U.S. market is above 23. It is important to note inexpensive currencies, stocks, bonds, commodities and real estate have the ability to become far more very inexpensive before they bottom. I am discussing my personal investment decisions because it is the question I receive most often. This is not investment advice for everyone. I like to buy assets when they are cheap and hated with the full understanding they can become much cheaper and even more hated before they bottom. My hope is emerging market currencies and stocks continue to fall in the years ahead and their markets move from cheap to extremely cheap. On the opposite end of the spectrum, the bubblicious U.S. stock market is so far removed from reality in terms of price and sentiment that it is not even worth my the time to look at it. That will change some day, but we are a long way away from that day. In the early 2000's I began reading a lot about financial history and the growth of debt taking place around the world. This reading led me to investing in gold and silver, which I began to accumulate in late 2004. I purchased month in and month out until early 2008 when it felt like the metals were beginning to receive global attention and the prices felt expensive relative to where I began purchasing. I held the metals through the boom in 2011, and I still own that physical metal today. I began accumulating silver again when prices fell below $30 an ounce and I began accumulating gold mining shares yesterday (more on that below). Essentially, my purchases in 2004 - 2007 looked great on paper up until 2011, and my holding and buying have looked stupid on paper ever since, while gold and silver have fallen relentlessly over the past four years. I consider myself someone who still has many working years ahead of them, which I hope means many years of adding to my investment portfolio. With that understanding, if I believe an investment has strong long term fundamentals, lower prices make the investment more attractive to me. 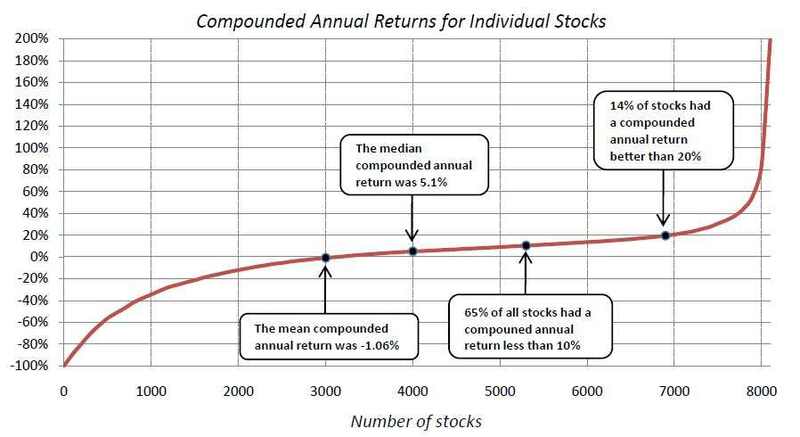 If an investment goes up in price (all other factors staying the same) the asset is less attractive to me. Humans naturally understand and follow this process in every part of their life, except investing. If a TV, car, piece of clothing or food item at the grocery store goes on sale (all other factors staying the same), consumers are more likely to purchase that item. It becomes more appealing. If a stock, bond, commodity or currency goes on sale (all other factors staying the same), people are less likely to purchase that item. The lower a financial asset price falls (all other factors staying the same), the more people want to sell it and become more fearful about purchasing it. I have covered this topic surrounding investor psychology numerous times in the past, but it is important to review again today as it correlates perfectly to what is currently taking place with precious metals. I mentioned I began purchasing gold and silver in 2004 because I was concerned about global debt growth. What has happened since 2007? Global debt has mushroomed in size while incomes and economic growth have been stagnant or in decline. I use the 2007 date because many people believe the world has gone through some sort of deleveraging (reducing debt) since the financial crisis began. 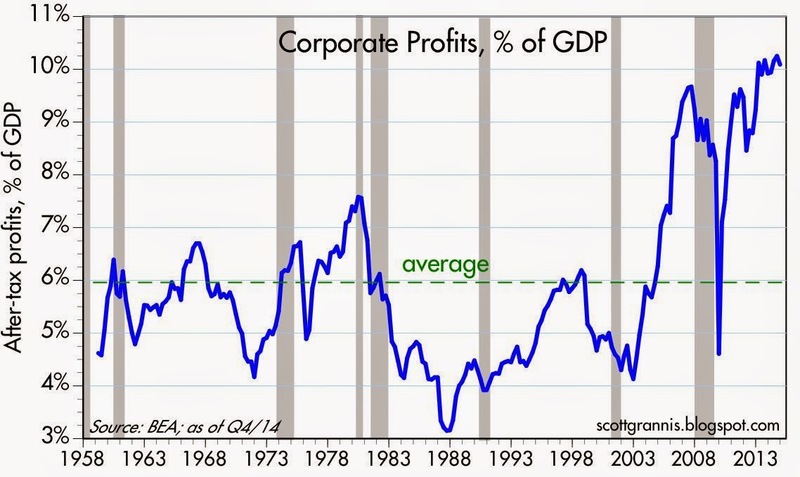 The exact opposite has occurred with individual, corporate and government balance sheets swelling in size. It was clear to investors following the financial crisis why someone would own gold in their portfolio. Many individuals, corporations, banks and governments would be unable to make good on the money they borrowed if a creditor ever asked them to repay the debt. After witnessing the government response to the financial crisis in 2008 the blueprint became clear for the future. If there was ever trouble, governments would step in with additional debt which would be purchased by central banks with a printing press. Taking the logical next step through this process shows this will ultimately lead to a far greater crisis in the future. This logical, easy to understand end game has been lost and forgotten with a surging stock market and falling precious metals prices. The charts now "prove" there is no danger ahead. The belief in paper currency, which has been astounding for me to watch over the past 8 years, has only grown. Instead of fearing potential devaluations or defaults in the most bankrupt parts of the world, investors have rushed to those areas to purchase bonds even as interest rates moved negative. 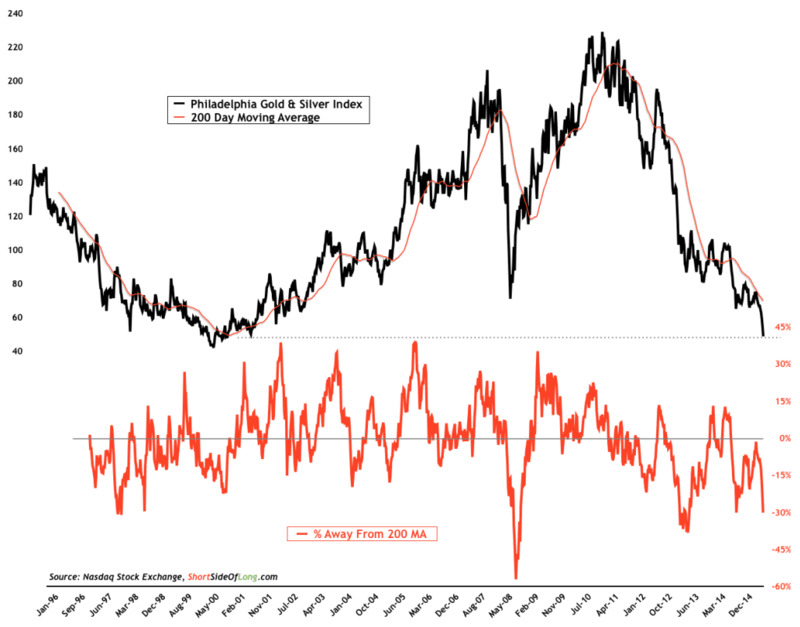 Forbes: "How Low Can Gold & Silver Go?" Market Watch: "Gold's Slump Is Here To Stay"
Fox Business: "Gold Teeters, Headed For More Losses"
Bloomberg: "Investors See No Reason To Buy Gold"
Market Watch: "Gold's Crash Isn't Over"
USA Today: "Gold Loses Luster"
Financial Review: "Gold To Hit $1,000 By December"
Market Watch: "Why Gold Is Falling and Won't Get Up Again"
That sentiment looks bullish, however, when you compare it to what is happening in the mining sector. The Philadelphia Gold and Silver Index below, which tracks a large basket of mining shares, has now moved to prices last seen in 2001 when gold was trading around $300 (gold is at about $1100 as I write this morning). The GDX, which is the most widely tracked gold mining ETF, fell 11% in trading yesterday alone. I entered the market yesterday to begin buying the GDX when it was down 8% on the day, only to check back after the work day to see it had already dropped another 3%. 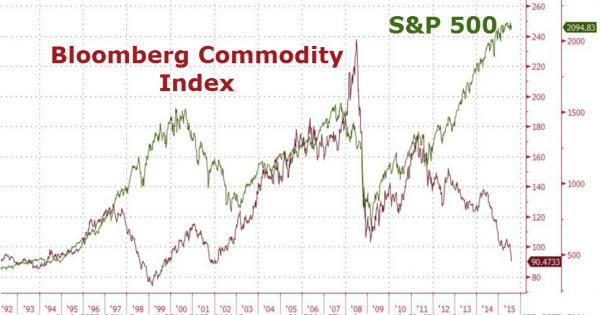 As I write this morning gold mining shares are perhaps more depressed than any asset class in history. Does that mean they have to stop falling from here? Of course not. The market believes gold will fall below $500 in the months and years ahead and stay there forever, which will make every mine on the planet unprofitable. That may happen. I do not believe it will, so I am currently purchasing mining shares (along with steady silver buying). If mining shares and silver continue to plunge in price (and fundamentals behind the metals do not change) then I will accumulate more, at a greater pace and size. Maybe this time global debt and money printing will have a long term positive impact on the global economy, while every previous time in history they they have lead to slowing long term growth and/or a crisis. I am betting this time is not different.